Indian names: pedda-ita (Andhra Pradesh); kajar, kejur (Bengal); kharak. 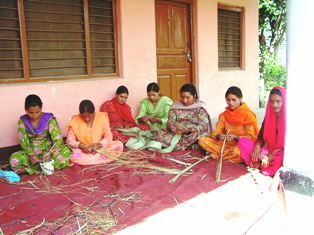 khakri (Gujrat); khujjoor, khajroo (Himachal Pradesh); khajur, khajuri (Hindi); andadayichali, sunindu(Karnataka); inta kattinta (Kerala); sendi, boichand, sendri (Maharashtra); khajuri, kohari (Orissa); khajur (Punjab); khajuri, dushpradarsha (Sanskrit); icham (Tamilnadu). Khajru is gregarious in many parts of India. It is commonly found on low ground in the sub-Himalayan tract, along the Ramganga River in Rohilkhand and along river banks and on stretches of low ground in the Deccan and Mysore. 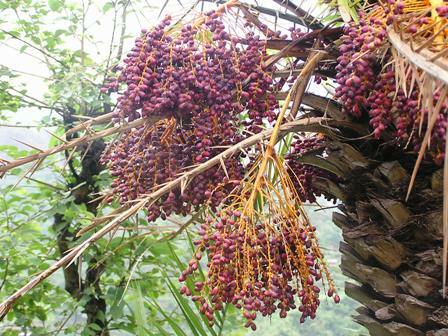 A wild date-tree yields very much less than a cultivated date-palm (Phoenix dactylifera L.). 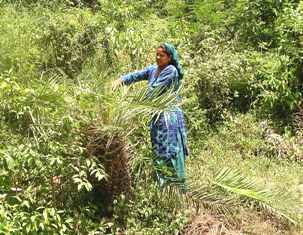 The khajru under Jabli conditions were found to yield only about 7 kg of fruit. The fruit is cooling, oleaginous, cardiotonic, fattening, constipative, good in heart complaints, abdominal complaints, fevers, vomiting and loss of consciousness. The juice obtained from the tree is considered to be a cooling beverage. The roots are used to stop toothache. The fruit pounded and mixed with almonds, quince seeds, pistachio nuts and sugar, form a restorative remedy. The central tender part of the plant is used in gonorrhea.